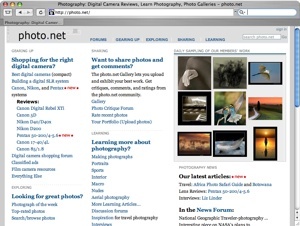 This is a long running website by Philip Greenspun that covers all areas of photography. It includes reviews of virtual all cameras, as well as sample photographs. 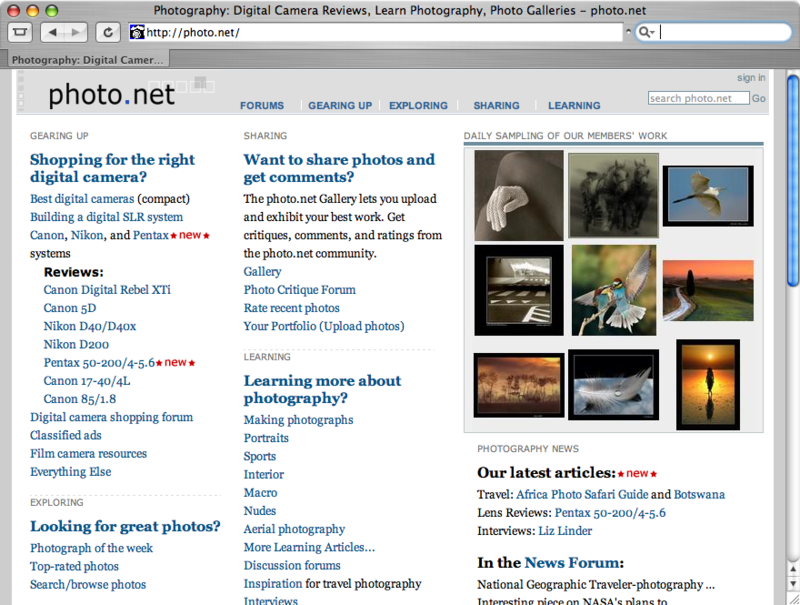 There are forums and you can even post your own photographs for criticism. It is a very simple site which makes it a pleasure to use. If you are planning to buy a new camera, you will spend hours here. Show the ladies you know how to dress with class with this hilarious Ask Me About My T-Rex Flip Up T-Shirt at Amazon.com! 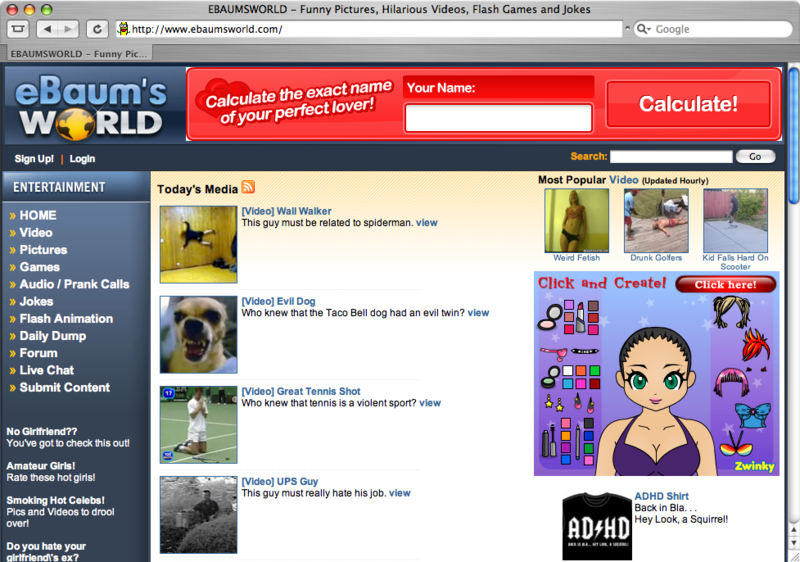 Ebaumsworld is a great site updated daily with hilarious videos, jokes, links, and forums. It has a huge following and you can spend hours lost in the midst of this site. The site also features cool flash games. I should also add that ebaumsworld have sent a generous amount of traffic to this site via the dailydump. 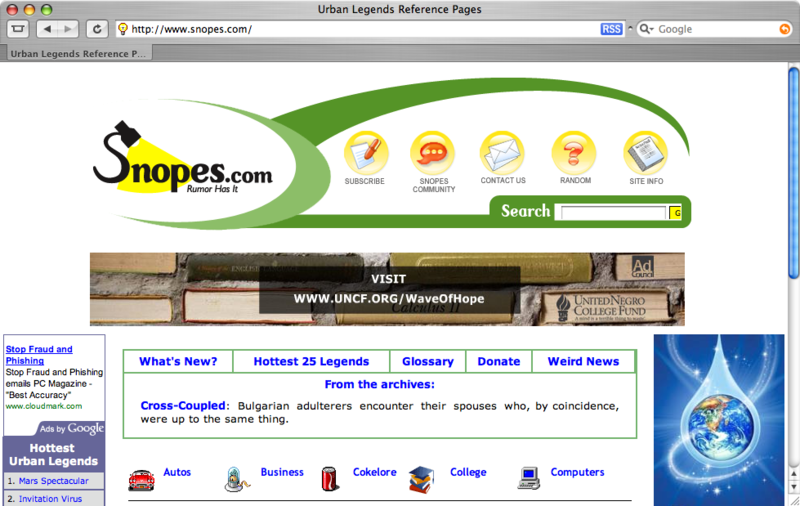 I have spent hours in the past reading through this website. It gives a great expose of the horrors of Scientology (the Cult created by L. Ron Hubbard). It has millions of articles on Hubbard, the Cult itself, Dianetics, and even has fascinating stories by people who escaped from the clutches of the organisation. This one is a particularly good read (warning – it is long!) and is the only book I have read from cover to cover online. 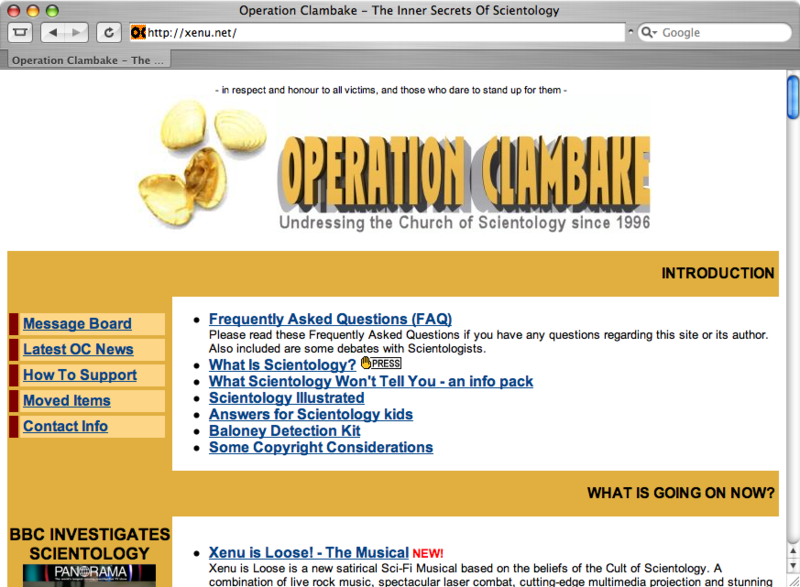 I would also recommend viewing Lermanet (the site of one of visitors) for more extensive Scientology information. 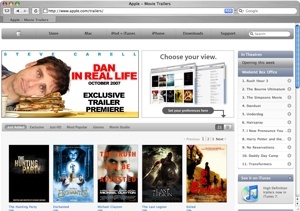 Apple have the latest trailers for current movies on the QuickTime section of their website. 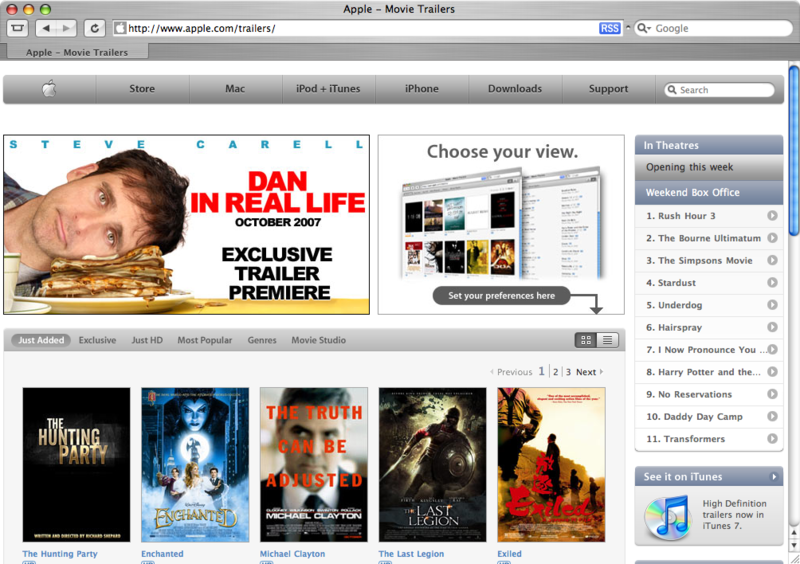 Many of the trailers are in HD and they are all downloadable (if you have QuickTime Pro). Suitable for viewing on any OS. Some of the current films in HD are Pirates of the Caribbean: At World’s End, Oceans 13, The Bourne Ultimatum, and many many more. Check them out. 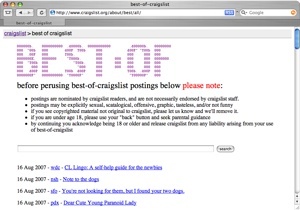 This site was started up by Cecil Adams. Who is he, you may ask? This is what he says: “Cecil Adams is the world’s most intelligent human being. We know this because: (1) he knows everything, and (2) he is never wrong.” Cecil writes for over 30 newspapers providing the straight dope on virtually any question you may have. This is a brilliant site and I have to confess to having spent whole weekends doing nothing but reading it. I guarantee that you will leave this site smarter than when you went there. Here is today’s question: What’s better for the environment, electric hand dryers or paper towels? I feel a little dirty posting this – but as much as it is embarrassing to say it – rating people based upon their looks is a great way to pass the time! You can choose from all gender types and ages and rate people’s photos from 1 (not) to 10 (hot). You can even add your own photo to be rated and make dates with some of the people there. I won’t tell you whether my photo is on there or not. Like writing? Make your own boredom-busting mark on the internet with How to Make Money Self-Publishing on Kindle at Amazon.com! 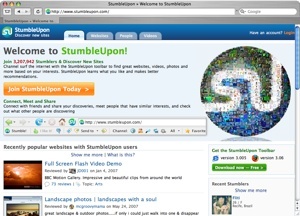 Stumbleupon is a social site with a difference – instead of picking the sites you want to see, you tell stumbleupon what your interests are and click a button which takes you to a random site. This is dangerously addictive. 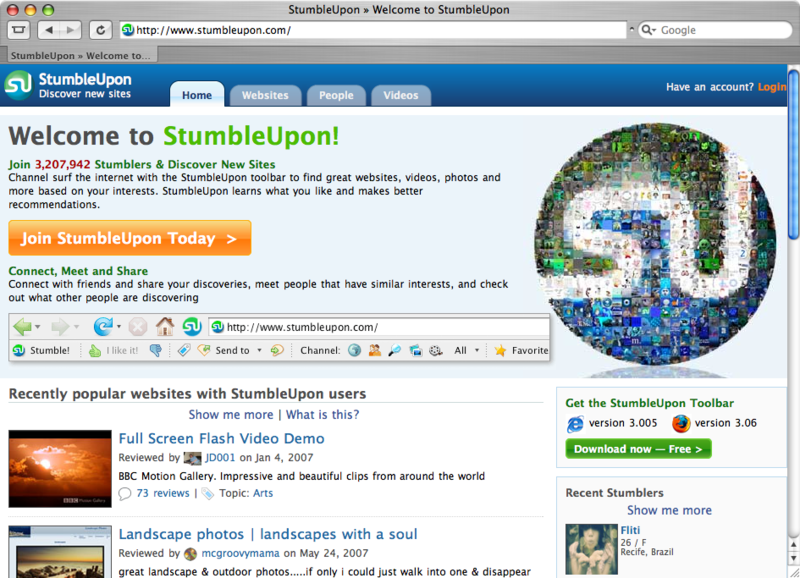 It works best with the Stumbleupon toolbar installed. Unfortunately the toolbar is only available for Firefox and Internet Explorer. Definitely worth a look. 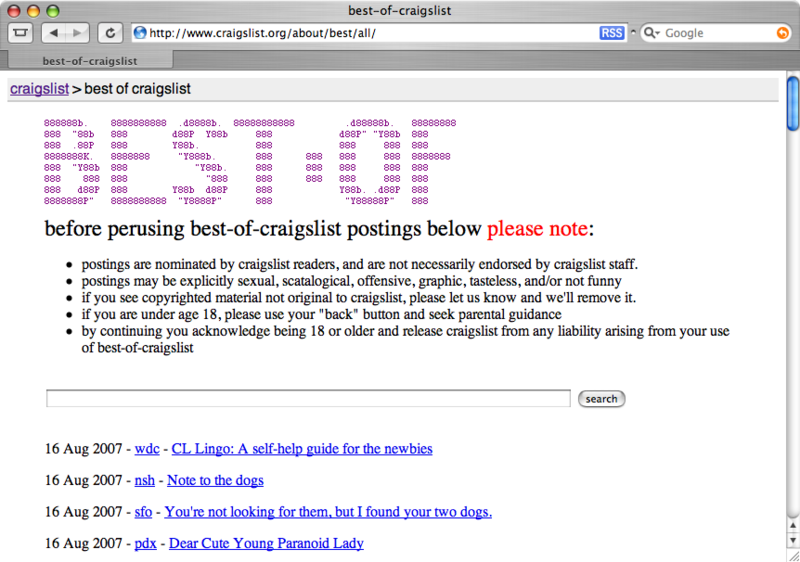 By far one of the best time wasters on the net. 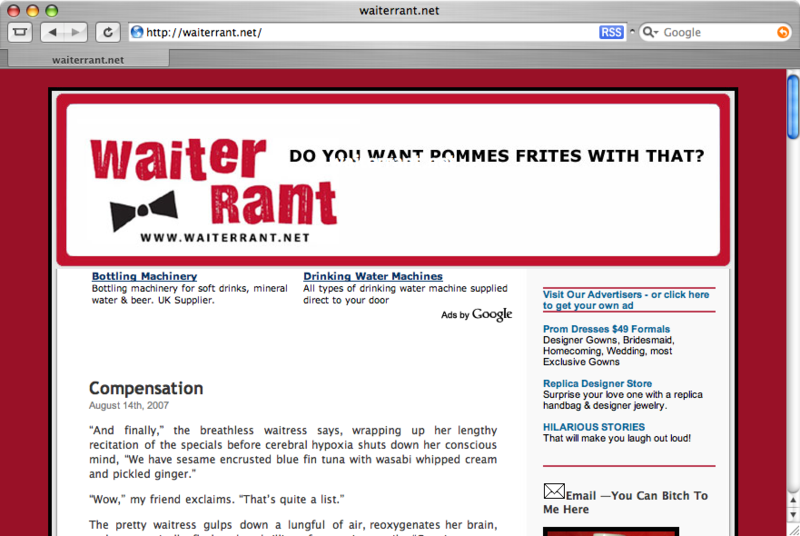 The anonymous waiter who writes this blog seems to suffer all of the worst things you could imagine a waiter suffering. He always puts a funny slant on his activities and experiences and you can just read for hours on end. I assure you – once you get a taste for this blog you will always go back for more. There may be some controversy over whether this one deserves the top rank, but I think it does and this is why: whenever I am bored and need something to fill in a bit of time, this site does the trick. I don’t spend hours there, I don’t go there looking for anything in particular, I just read a few of the articles and get back to what I am meant to be doing. 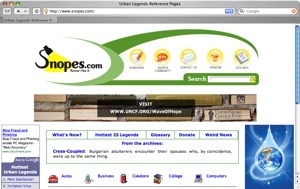 The site is all about urban legends and it covers a wide variety of topics such as Celebrities, titanic, food (there is an section on Cokelore), and much more. Not only do they tell you whether the legend is true or false, they do background research and often provide quite detailed information. I would also like to give honourable mention to the following sites: Digg, Reddit, Fark, Youtube, Wikipedia, and Slashdot. I certainly hope that you find this a cure for boredom and get many hours of interesting surfing. Oh – and out of humility I haven’t added the List Universe, which is, of course, the real number 1!